The state of Connecticut's highest paid employee announced his retirement on Wednesday: The press and other members of the college basketball world greeted Jim Calhoun's retirement from UCONN basketball (after 26 years and national championships in 1999, 2004 and 2011) with, mostly, a predictable whitewash of his impressive but checkered tenure and, less frequently, by pointing out that Calhoun's most immediate legacy—if not, probably, the one that will last longest—is leaving his basketball team in total disrepair. Other college basketball coaches have made exits that made them look far worse—Billy Gillispie is currently making a case for awkwardest final days coaching a program ever—and Calhoun cited legitimate health problems as reason for leaving now. 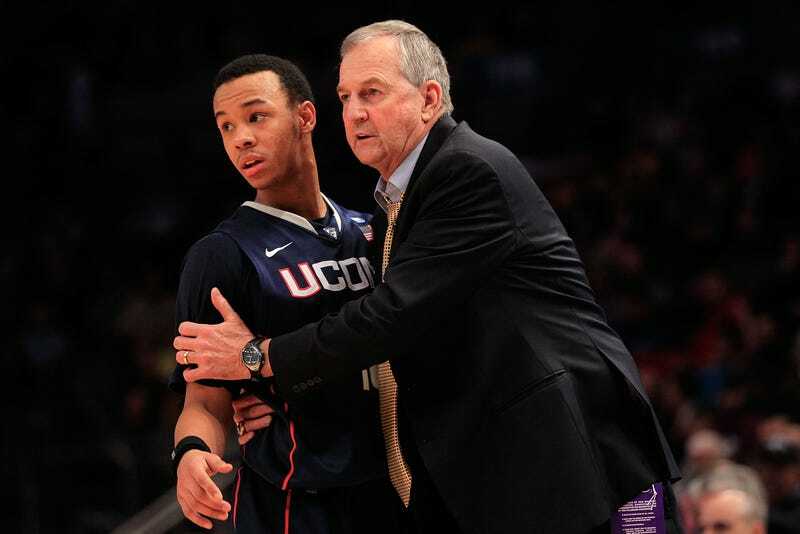 Still, the specifics of Calhoun's exit might raise eyebrows if Connecticut wasn't so busy mourning the man who yelled UCONN into athletic relevance. In June came news of the university's newest problem with the higher-ups: the men's basketball team had failed to meet the lower cut-off point of the NCAA's cursory, at-least-pretend-to-go-to-class APR metric. At the time, the lower limit of academic engagement corresponded to something a little below a 50% graduation rate over a given four year period (the NCAA calls it "a term-by-term measure of eligibility and retention" intended to predict graduation rates). UCONN's men's basketball team couldn't cut it; the NCAA, as it's done with schools like USC for other infractions, took UCONN out of contention for the postseason, meaning no Big East tournament and no March Madness run in 2013. Calhoun served a suspension in 2009 for "failing to maintain an atmosphere of compliance"—cheating a bunch—and two assistants resigned amid concerns over that non-compliance (in particular, the recruitment of Nate Miles, who received various improper benefits from UCONN-affiliated boosters and was, when the New York Times caught up with him in 2011, "effectively homeless"). Calhoun told reporters "that the idea of bringing closure to that issue was a 'major, major factor' in his decision to come back after the 2011 championship season." Now? Closure after the most recent round of NCAA sanctions will be much tougher to come by. The Huskies have no chance at any kind of postseason this year, and in the years to come the Big East will change rapidly into something unrecognizable. Basketball stalwarts Pitt and Syracuse are leaving the Big East in 2014, West Virginia and Notre Dame are already gone. Replacing those schools are UCF and SMU (UCF is also facing down a postseason ban this year) along with Houston, Temple and Memphis. Whether the level of play meets that of the once-proud Big East basketball conference remains to be seen, but geographic disparity and constant instability are taking some of the romance out of it. Whether UCONN can return to glory or not, they'll never have dominion over the Big East again. Literally. For Calhoun's part, he's refusing to let UCONN fully wipe away his fingerprints and start anew; as noted here, he "dragged out his increasingly likely decision just long enough to ensure his preferred choice, former player and current assistant coach Kevin Ollie, would have to get a one-year trial run as the head coach." The same article features the menacing detail that Calhoun, as of a few days ago, was still sitting in his office, saying to Ollie, "This is a nice office to be giving up." Ollie replies, "Whenever [Calhoun] wants to give that up is fine. I don't know how long that's going to take." The article has him pausing for laughter, but doesn't say whether it's nervous laughter or not. Luckily, there are a lot of #coolmemories in Storrs. It could take a while to make some new ones.